Pictured L-R: Will Kerlick, CenterStaging Business Manager, and Doug Dubin, CenterStaging Audio Manager, with CenterStaging’s new Roland M-5000 OHRCA Live Mixing Console. © 2015. Los Angeles, CA, August 5, 2015 — CenterStaging in Burbank, California, is among L.A.'s premier rehearsal and backline facilities, specializing in production and technical support for television and live performances. Recently they took delivery of the new M-5000 OHRCA Live Mixing Console from the Roland Professional A/V Division. CenterStaging has big plans for the console, both on-site in their state-of-the-art rehearsal studios, and in the field as part of their backline rental arsenal. In fact, they’ve already been putting it to good use, notably during rehearsals for the BET Awards. For more information, please visit http://proav.roland.com/ohrca/ and http://www.centerstaging.com/. 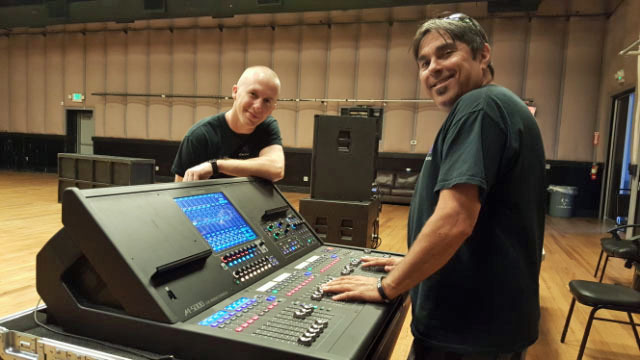 Photo caption: Pictured L-R: Will Kerlick, CenterStaging Business Manager, and Doug Dubin, CenterStaging Audio Manager, with CenterStaging’s new Roland M-5000 OHRCA Live Mixing Console. © 2015. CenterStaging is L.A.’s premier rehearsal and backline facility, specializing in production and technical support for television and live performances. CenterStaging works closely with notable production companies who produce some of the most watched and anticipated live events, such as the GRAMMY® Awards, American Music Awards, Billboard Awards, American Idol, Country Music Awards, the Coachella & StageCoach Music Festivals, and many others. The facility offers 10 state-of-the-art rehearsal studios, including a brand new dance-specific studio complete with mirror wall, playback, and Harlequin Liberty sprung wood floors. Other CenterStaging services include an extensive range of backline, an instrument repair center, storage lockers, cartage services, and onsite cafe & catering facility.